This interview was conducted by the late Carmen Mitchell aka Princess Tam Tam (R.I.P) and I just had to share this while thinking of the great we both had during the time period of which this interview was written back in circa 2006 – 07. I truly miss Princess Tam Tam and not only was she a great friend but one of my artist on my label.She was a true supporter of our musical culture and is missed by many of our peers. 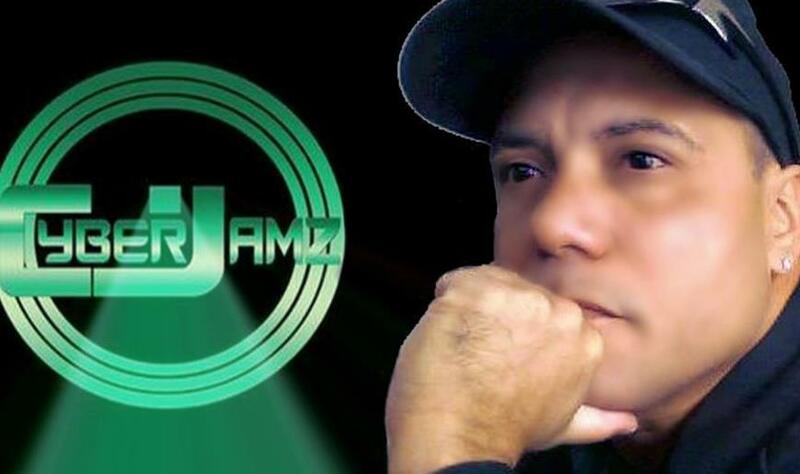 Sammy Rock aka Soul Oasis is the founder of Cyberjamz Internet Radio est in 2003 with collaborative efforts by our Cyber-Team of programmers,producers,artist and sponsors. Cyberjamz Radio has a staff team of about 30+ shows which air every day.We also offer at our site the world famous chat room, members forum,a huge archive link to revisit any show you may have missed,broadcaster page with info on our programmers,a front page news section,track link page with direct hyper-link to our new releases,a communities page offering banners to our show,sponsors,upcoming music events and much more. The site also has our top of the line web-tech master Mr.Techy and of course simple navigation system to connect to our live streams and other links at our site. Sammy Rock is also the founder of the popular digital record label – Cyberjamz Records offering over 90 + releases under it’s belt and features some of house music most committed artist and producers which are too many to mention.To purchase any of our releases from our catalog please visit your favorite digital on-line stores. The House of Soul Show w/Sammy Rock & partner Dj Housecat airs live every Monday from 9am – 2pm est.This hot show offers some of the best in deep house,house music,electronic dance music and any other form or genre of music that we so love to share.This is just one element of how we contribute to our musical culture. If time permits check our my podcast page to stream or download mixes by yours truly and Dj Housecat. We hope you enjoy the music and experience what we have to offer here with all of our Cyberjamz Radio Family. Cyberjamz Internet Radio established in (2003). SammyRock started in the music business with a Mobile DJ operation in 1980-1988,also started by collecting 45s and albums from his parents at the age of seven years old.He now owns over 30,000 records which Sammy continue to use to make the business work.He has spun muisic for over thirty – five plus years and has entertained thousands of party goers across the globe.In additon he has also played music in various New York City Dance Clubs in the Bronx and have done guest spots at local radio stations in NYC,NJ and Tampa Florida. Q.How did you get your start in the music business? A.I started in the music business with a Mobile DJ operation in 1980-1988. I started by collecting 45s and albums from my parents at the age of seven years old. I now have over 30,000 records which I continue to use to make the business work. I have spun for over twenty-five plus years and entertained party people across the globe. I’ve also played music in various New York City Dance Clubs and have done guest spots at local radio stations in NYC,NJ and Tampa Florida. Q.How and why did Cyberjamz Radio begin? A.Cyberjamz Internet Radio began when “some” people were discussing the possibility of the death of dance music in general. In order to prove that our musical culture was and is still alive, an outlet was needed for djs to express themselves, continue our musical journey and connect the true house music people back to their roots of music. Hence, I created Cyberjamz Internet Radio www.cyberjamz.com . I must say it’s been a success. I was one of the first broadcasters doing fifteen hour sets everyday for seven days a week! along with Timmy Richardson(One of my first broadcasters). As time passed, more and more broadcasters (DJs) became interested in the vision that I had in reference to keeping house music traditional. I must add that without the blessings from above to fuel my spiritual drive, Cyberjamz would not be where it is today. I want to thank the spiritual world for guidance. Q.What do you think of the role of traditional broadcast radio when compared to online and satellite radio? A.The role is quite different in that in traditional radio a select format must be followed vs. online and satellite radio where it’s more flexible to express yourself.There are no FCC regulations to follow so there is more time to share music,pluse there are no commercials and more freedom of speech. Less formatting and more music: this is what I love about online and satellite radio. Q.How you recruit people for your programming? A.I recruit the broadcasters based on their demo mix tape session, knowledge of all kinds of music and of course attitude. I would not consider someone for programming based on how popular they are or their ego. They must be able to become part of the Cyberjamz family and work as one unit and keep the music and programing interesting by connecting with the listeners. Q.Where did you get the name Cyberjamz from? A.Funny you should ask this. I sat down to think for a minute in front of my computer. It was like a bolt of lighting!! I stood up and said to myself, all these wonderful people in the “Cyber” world, why not serve them with some “Jams” aka Tunes. It really took some time for the name to stick, but by the next day I convinced myself that the words Cyber(space) and Jams fit well together. I then wrote both words and changed the last letter from “s” to “z”…Now we have a place we now call home for music: Cyberjamz Radio! Q.Where do you see Cyberjamz five or ten years from now? A.It’s been eight years now that Cyberjamz has been on-air and it was and is one of the very first internet radio stations for housemusic and still is in the forefront of our underground music scene. We have and still are progressing, by adding new shows. We also had participated in XM Satellite Radio at one point in our eight years on the map.We were a part of XM Radio The Move on Channel 80 until thier programming changed due to the popular EDM craze that has swept our music scene the last few years.I’m hopeful that someday Cyberjamz will be a part of XM/Sirus Radio. As far as the future for Cyberjamz Radio? Only the spirit world knows for sure, but what I can say is that Cyberjamz Radio and our supporters,sponsors and lovers of music all love our station and appreciate all the hard work that goes into creating something out of nothing. It was done with a vision,commitment and faith.Whatever it takes to make it work.We also have expanded our sit by adding a second channel with features hot shows by some of our most committed programmers and continue to add more shows. Q.How had the internet changed your relationship with and to music and the industry? A.The internet is a fantastic way to convert the unconverted. An opportunity to express,share our musicical knowledge,and play all kinds of music for the people.Many love this idea because it brings the music to directly to them.In addition it allows lovers of music across the globe to experience the deejay’s we offer and give them access to all the new or classic tracks that the programmer has to offer.Cyberjamz has changed the way we communicate via the internet using all the tool availiable for those that do not attend dance clubs or just want to experience those special musical moments we’ve all had in our lifetime. Cyberjamz Internet Radio and it’s programmers offer live shows; therefore you are listening to a live feed from broadcasters/djs from all over the world. This is what makes Cyberjamz Radio special. The industry has now taken notice of our station and the ways of the cyber-world,also the music industry now understands the power of the internet; therefore their music can be heard by a much larger audience than regular radio, especially if in the genre of underground,deep,tribal and housemusic. The music industry has now embraced the fact that the internet radio stations like Cyberjamz can make a difference in sales,expose thier artist and prouducers as well as record label.We help them promote and prepare a better marketing tool for their upcoming releases by allowing us to market their product before it hits the stores. This is something Cyberjamz Radio is very proud of and we are here to serve you the listener and our musical culture by keeping house music traditional. Toupee Records on FB – DjHousecat(la gata de fuego) label. Cyberjamz Radio & Records on Twitter.